You’ve fallen or slipped and fallen on your knee. You’ve had a knee injury! Maybe you felt or heard a snap or maybe it just swelled up after the injury. If you heard a large snapping sound when you fell, its quite possible that you have done some damage to the cartilage in your knee. Possible damage can include the Anterior Cruciate Ligament (ACL), Posterior Cruciate Ligament (PCL), or either the Medial Collateral Ligament/ Lateral Collateral Ligament. Other possibilities include the medial or lateral meniscus. No matter what, your knee will likely hurt and swell up. Swelling is a normal response to an injury to your knee. In general, the more swelling, the more internal damage that exists. The good news is that most knees can get better conservatively with proper physiotherapy care. The most important part of treatment is to make sure that there has not been a fracture to the knee. Once it is confirmed that no fracture exists, the next step is to quickly start a proper physiotherapy program. A good physiotherapy program will start with Interferential therapy and ultrasound. It is essential that you begin/maintain movement of your knee in order to prevent further problems. It will often feel like you want to stop moving the knee to protect it. However, knees always do better if they keep moving after injury , (within moderation). A skilled physiotherapist can guide you in this regard. It is advisable to continue weight bearing and walking normally as this helps to speed up recovery also. Even if the ACL has been completely torn, you will want to maintain full movement of your knee and continue walking without crutches or aids . The exception to this is if you cannot walk without limping, it is advisable to use a cane to offload the knee while walking. This will protect your other joints until you can walk more normally. Restoring normal range of motion of your knee is step one following an injury. This is followed by strengthening of the surrounding musculature in your leg. Lastly, you may have lost proprioception in your knee. This is your body’s way of telling your knee where it is in space. In other words, it is how you catch yourself from falling if you slip or lose your balance for any reason. You can regain your proprioception with very specific balance exercises that your physiotherapist can teach you. It is fully retrainable and essential to regain fully in order to avoid falling again in the future. Occasionally a proper custom knee brace may be helpful. However, this is best determined by a skilled physiotherapist so that further damage is not done by selecting an improper or poor fitting brace. Typically, the only time that a knee is immobilized is if there has been a fracture. Other times that a custom knee brace might be selected would include when there has been damage to the ACL. 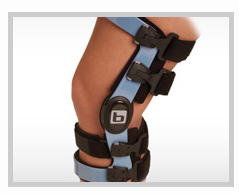 In this case, the brace can help to maintain full movement of the knee while supporting the ligaments of the knee. Custom knee braces may also be helpful when a meniscus injury has occurred. 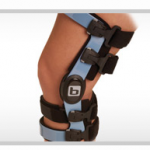 The brace can offload the side of the knee that has been damaged thereby allowing a continuation of normal activities while awaiting further diagnostic testing, awaiting surgery to correct the damage, or forever if no further intervention is desired. Bottom line is you will want to be assessed and treated by a physiotherapist skilled in treating knees. You will likely want to have an X-ray and ultrasound of your knee to rule out fractures and possibly provide some information about the damage done on your knee. You will want to be seen quickly. Assuming there is no fracture, you will want to keep that knee moving! You may benefit from a custom knee brace depending on the type of injury you have sustained.